The 2019 MOTUL FIM Superbike World Championship season is about to begin, but riders are not taking any rest before heading Down Under for the season opener which will be held in Australia from 22nd-24th February. Apart from working on every single detail of their bikes, they have been taking care of every single aspect of themselves over the winter. From intensive training sessions in the gym, to long ride cycling on the roads, skiing and even a bit of hiking, riders have been working on improving their strength, concentration and of course, increasing their riding skills. Returning to Italy after four busy days of testing at Jerez and Portimao with the all-new Ducati Panigale V4 R of the BARNI Racing Team, Michael Rinaldi was still eager to ride and joined fellow Ducati MotoGP™ riders Andrea Dovizioso and Danilo Petrucci, and Italian Moto2™ riders Enea Bastianini and Alessandro Zaccone for a few more laps on a motocross bike. Rinaldi has been doing motocross alongside the Italian MotoGP™ stars for several weeks during the winter. 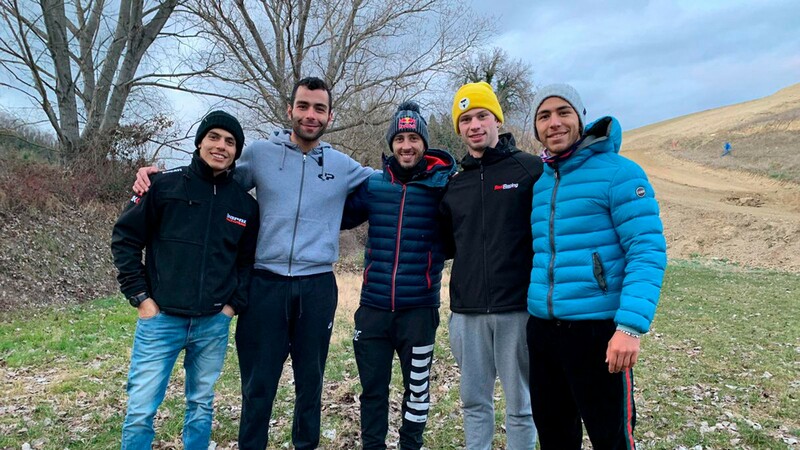 Motocross helps improving riders’ abilities on the tarmac, and by training like this, the 22-year-old also hopes to be ready to tame the new red machine from the Bologna manufacturer and achieve stunning results on his first full-time season in WorldSBK. Find out how Michael Rinaldi and the BARNI Racing Team will do on the opening round at Phillip Island, all with the WorldSBK VideoPass.